The Veterans Plaza at McCormick Park will look distinctly different to anyone who may visit this weekend in recognition of Veterans Day. The plaza has a massive new slab of concrete and a 20-by-40-foot covered awning erected on the south side of the plaza. The American flag will be also be hung in the park, mounted on a shortened flag pole, which allows the flag to still be seen from under the awning. Two granite stones inscribed with the names of World War I, World War II and Korean War soldiers from Columbia County, a Blue Star Memorial plaque and the Veterans of Foreign Wars 105-mm Howitzer cannon are no longer in the plaza, however. The cannon has been temporarily stored, along with the Blue Star Memorial plaque, but the two granite pillars will not be returning. Gene Hester, the post master for St. Helens Veterans of Foreign Wars Post 1440, said some people might see the new features and express astonishment that "that's it," but the new installments are just the beginning of the Veterans Plaza redesign. Earlier this year, the VFW embarked on a planned expansion of the plaza and partnered with the city of St. Helens, which obtained a large chunk of grant funding last year to help pay for the project, to do the work. The original expansion design included extending the concrete platform, building the covered awning to provide visitors respite from the elements, and adding several matching granite pillars with names of additional Columbia County soldiers who have died in other wars. The goal was to have the newly designed plaza complete by this Veterans Day, but when a worksite accident resulted in severe damage of one of the original granite pillars, the project's completion date was pushed back and organizers went back to the drawing board. "The existing war memorial was bumped and the granite slab fell and shattered," said Jennifer Dimsho, the city's associate planner. "That was a surprise and also a huge opportunity because those were replicas of wooden memorials that were used on Highway 30. It was kind of a blessing in disguise because we could go back and correct and add names to the list." ow to best represent all fallen soldiers from Columbia County. 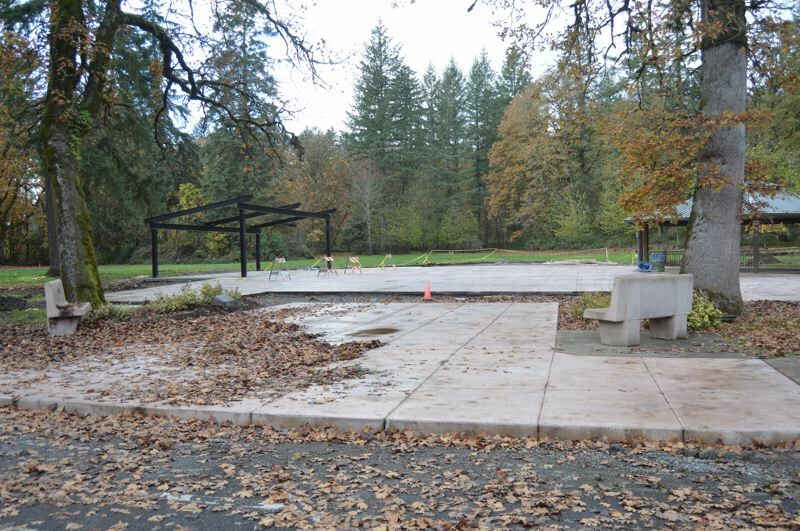 Andrew Niemi, owner of Lower Columbia Engineering, has donated his time to help the VFW, and representatives from the city, like Dimsho and Doug Morten, a city councilor and Vietnam War veteran, developed the final design for the plaza. Niemi also helped recreate the previous pillars. "It wasn't anything we'd hope for, for sure, but we'd considered doing one (wall) initially. We had decided prior to that accident to be budget conscious and to respect the history of those (pillars), but when that occurred, we decided that we should look at the big picture and what was going to best represent all of the soldiers from Columbia County," Niemi explained. 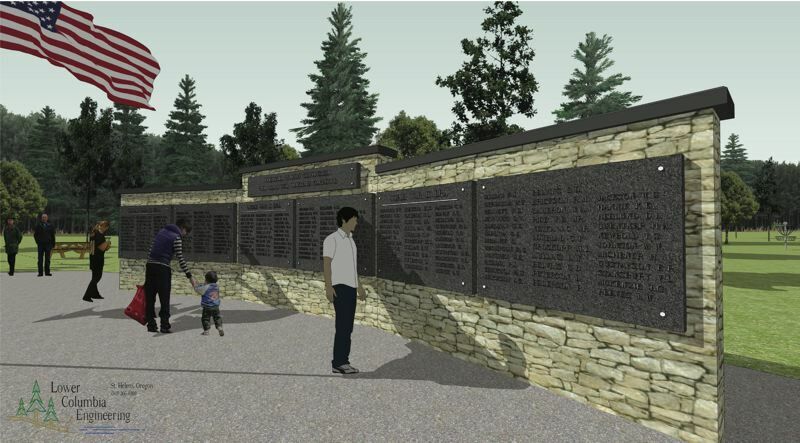 Now, all of the names of veterans killed in World War I, World War II, the Korea War, Vietnam War and the Gulf War conflicts will be incorporated into one 6-foot-tall, 36-foot-long granite wall covered with black stone. The plaza will also eventually include six flag poles to represent the Army, Navy, Marines, Air Force, Coast Guard, and Merchant Marines, along with plaques describing each branch of service. The expansion of the plaza also presented a chance to dig into the history of Columbia County and the residents who have served the country and died as a result. Over the past year, Brandon Sundeen of the Columbia County Historical Museum has been working to verify veterans from Columbia County who have died that will be included on the new wall, including adding names from various wars. Sundeen has researched newspapers, state and national archives, genealogy records and online resources to identify many people. In some instances, he has contacted families who did not know they had relatives who had served and died in military conflicts. "It's important knowing that, after awhile, there won't be anyone who knows who these names are, but their sacrifice deserves to be remembered. The least we can do is put their names on a wall," Sundeen said. Now, the VFW will need to solicit more donations and seek more funding to pay for completion of the plaza. The city obtained a $47,000 grant last year to help pay for the plaza, and the VFW has contributed nearly $50,000 to the project to date, and has collected $10,000 total in donations from Sen. Betsy Johnson and members of the public. During the Veterans Day ceremony on Sunday, VFW members will be handing out informational flyers which showcase the new design and explain the need for more fundraising to complete the work. Additionally, the flyers alert Columbia County residents to ensure their family members' names are included in the display before the plaque is inscribed. Hester said seeing the plaza tribute grow is an honor for him, both personally and as a member of the VFW, and an honor for all veterans. "Well, it means a lot to me. I can't even express in words," Hester said. "I guess it's one of the things that needed to be done because there's no recognition in the park for the Vietnam veterans and the Eastern conflict veterans. And that's how it all started. It started with that in mind."